summation of the activities and costs associated with each project must equal the total program. using the work breakdown structure as the common framework. or sections should be defined in subtasks and work packages. The level at which the project is managed is generally called the work package level. 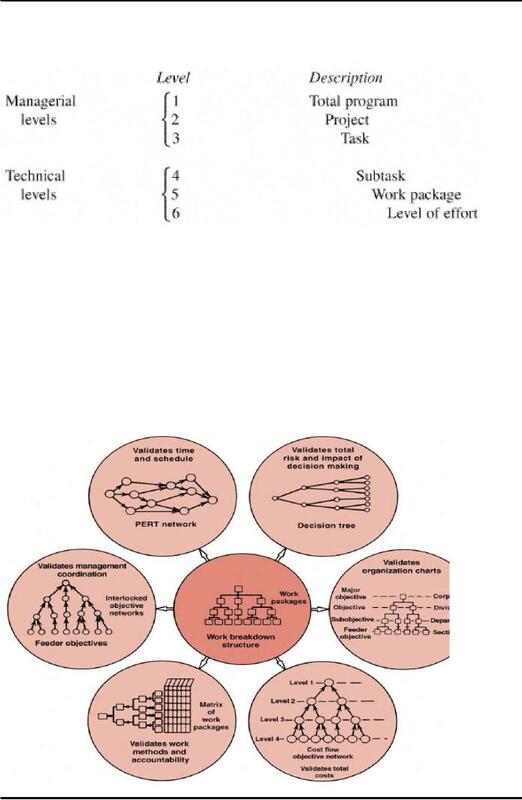 Actually, the work package can exist at any level below level one. allow all of the line managers to assess the risks in the Work Breakdown Structure (WBS). After all, the line managers are usually the recognized experts in the organization. provided to the project manager at higher levels of the Work Breakdown Structure (WBS). 80 hours and less than 2­4 weeks. However, this may not be possible on large projects. It is not necessary that work package documentation contain complete, stand-alone descriptions. have the same number of levels for all projects, tasks, and so on. Breakdown Structure (WBS) establishes the number of required networks for cost control. In case of many programs, the customer establishes the Work Breakdown Structure (WBS). Remember that applying these guidelines serves only to identify the complexity of the program. must be in agreement as to what is expected. The Work Breakdown Structure (WBS) and work description should be easy to understand. 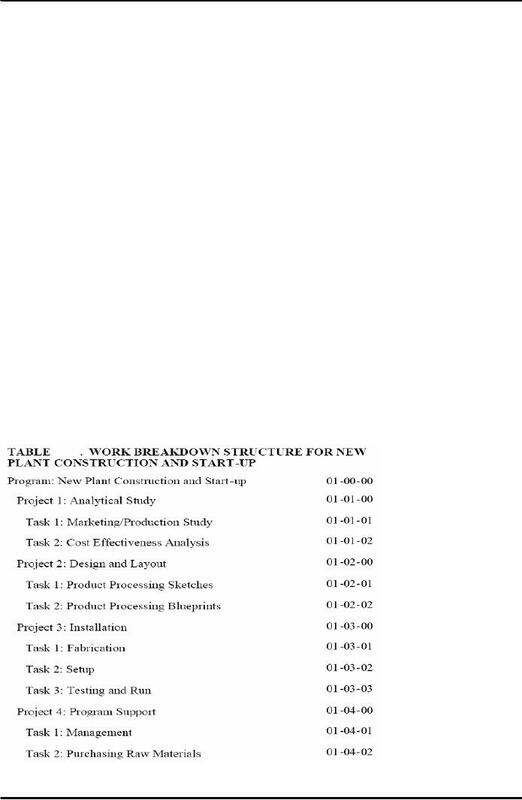 All schedules should follow the Work Breakdown Structure (WBS). flexibility in the Work Breakdown Structure (WBS). so that everyone will know when the milestones were achieved. 0.5 to 2.5 percent of the total project budget. levels are usually roll-up levels. which may have more than one million direct labor hours. become so complex that meaningful networks cannot be constructed. charge numbers are under the direct control of the project manager. may be impractical, even if line managers could control work packages of this size. Cost analysis down to the fifth level is advantageous, from a cost control point of view. 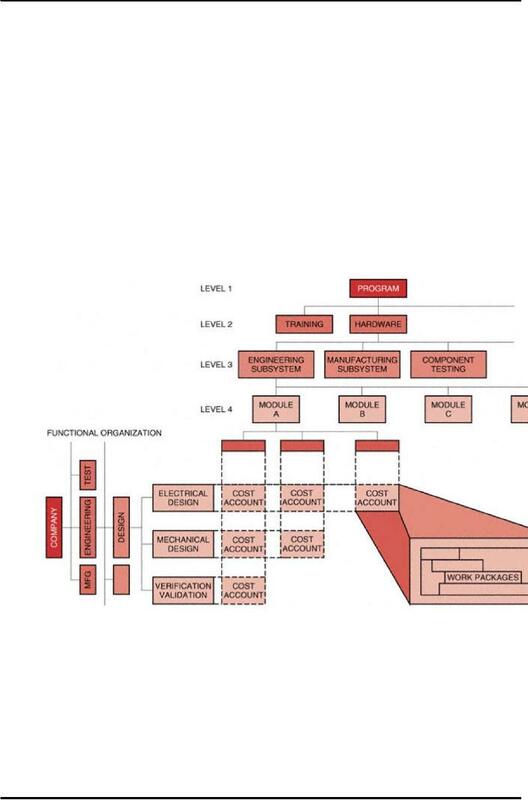 separately for each level of cost reporting below level 3.
will almost always exist a high degree of confidence that the objective can be reached. work package as described here. consider the lowest level as the work package. constant, regardless of the number of projects and tasks. eliminating activities from the Work Breakdown Structure (WBS) must reduce the scope of effort. easily modify his costs by eliminating the direct support activities of the canceled effort. the use of work breakdown structures, especially on repetitive-type programs.